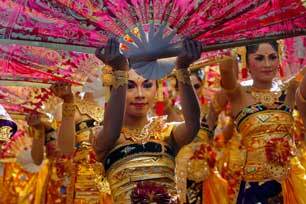 One of the largest annual celebration of art and culture in Indonesia, Bali Arts Festival is always crowded. During the month, various art performances, exhibitions and other cultural activities will take place in Bali, offering dance, music and beauty of their culture. Celebration of the famous attractions such as traditional dances that have been almost forgotten, the trace of a remote area in Bali, food, crafts, as well as new creations from dance schools in Denpasar and contemporary choreography of national and international artists.